The other day I was walking, and I tripped over nothing, which is not unusual. What is unusual is that when my foot came down hard, it landed right on a baby snake. Normally, this would send me into paroxysms of terror, but for some reason – perhaps because the little bugger was skinny as a worm and about three inches long – I had a different reaction. I felt sorry for it. This feeling was immediately enhanced when it contorted itself into a tiny reptile pretzel and flipped onto it’s back. 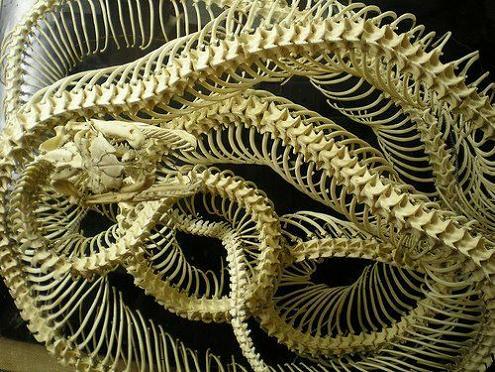 Then it had a snakey seizure. Then, nothing. I killed it. With my Converse-clad needle foot. Dead. That helpless little guy -or gal- didn’t stand a chance, didn’t even see me coming, and then: lights out, Lefty. The fat lady sang. And then stepped on your head. I tried to cheer myself up by remembering that I hate snakes and also any kind of nature that gets close to me, and I tried to tell myself that baby snakes grow into big snakes, with hideous, dripping fangs and an unquenchable drive to squeeze the life out of you, crushing your ribs like toothpicks before they eat you by swallowing you whole. I tried to envision the townspeople rushing out of their homes to hoist me above their shoulders and prepare a celebratory feast for me, the brave heroine who saved the village from the enormous, hypnotic serpent, who chased the innocent, like a mindless, rippling, merciless muscle, terrorizing them with it’s relentless appetite and remarkable force. (Who among us hasn’t had that dream, Sigmund?!) It didn’t work. I felt so sad at the injustice and randomness of it all. Poor baby snake. I felt badly for another snake once, but the feeling passed pretty quickly. One time, I was driving with McAdams – or, well, since McAdams was there, of course she was driving me– and I looked up at the sky, which was easy to do since McAdams has a way-cool convertible, and it was a thousand degrees, so the top was down, and guess what I saw? Clouds, you say? A bug? An overpass? All reasonable guesses, but WRONG! I saw a hawk, struggling ever higher, but laboring, because in his (or her) talons was a writhing Copperhead about the size and girth of a tree limb, which I realize is not the best visual, because tree limbs come in lots of sizes. Also, I’m not sure if it was a Copperhead, because I don’t know what a Copperhead looks like and it was far away, but I am positive it was very poisonous. Mayhaps it was an Anaconda. Doesn’t matter. 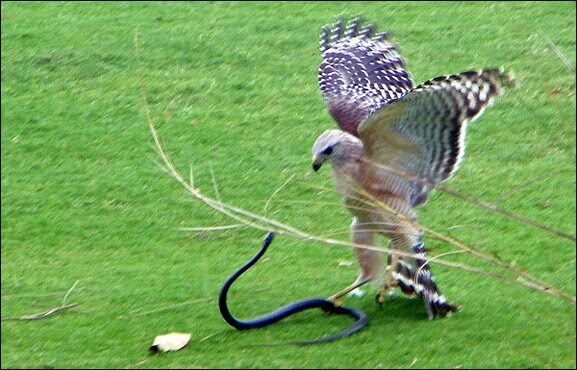 It was curling in on itself and undulating in the air, trying to get a piece of it’s feathered nemesis. Anyway, I was just amazed, because even though you hear about stuff like that happening, when have you actually seen it? I just happened to look up at that moment – I had been watching in the rear view mirror the way my hair blew prettily around my face – and got to see the primordial life and death struggle that played out up in the sky and heading towards the sun, above a flat, endless highway on a blazing Texas day. Damn! That’s pretty awesome, right! 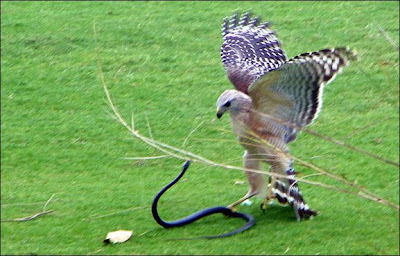 I felt sorry for the snake for a minute, but that’s how nature does, and besides, it suddenly dawned on me that if the snake proved too strong for the hawk, it could fall, heavy like a stone, and land right in the car, on my head. Afraid and enraged, it would no doubt stab me in the eyeball with it’s poison fang and then eat my face off, as those Black Mambas are wont to do. And even if it didn’t happen right then and there, now I knew that it could happen at virtually any time, for I had seen it with my own eyes, and so I screamed for McAdams to raise the roof, but literally and not in a ‘woot-woot” kind of way, and she did, but that is why, now, because I know what could happen, I look up a lot when I’m walking, which is what I was doing when I tripped and crushed the poor little baby snake the other day. Probably, the only thing I hate more than scary, creepy things like snakes, bears, nutria and pigeons are scary, creepy things that adapt or evolve. So you can imagine my horror when I saw this article from the Scientific American. http://www.scientificamerican.com/blog/post.cfm?id=flying-ophidians-physicists-uncover-2010-11-24 It has a lot of technical things in it, like the phrases “six meters per second to four meters per second”, and the word “ophidian”, if that is even a real word. The article talks about this Asian snake that “jumps” or “leaps” out of these really tall trees and then “takes its whole body and makes it into a wing” so that it can fly up to 800 feet. It doesn’t just fall or glide; it oscillates it’s body specifically to create a “vortex-induced lift.” Bastards! I don’t even know what that means and they have figured out how to do it! Watch the video! Those assholes totally know what they are doing! 800 feet, people! I don’t really know how far that is, but I know that’s is too long for a damned snake to be airborne! The world is too small for me and snakes. Except for little ones that are kind of cute. When they are alive, that is. Not so cute, dead. Rest In Peace, Lefty. Sorry. BONUS: Look at these pictures by Guido Mocafico. They are frightening, but fantastic! This entry was posted in Uncategorized and tagged Guido Mocafico, McAdams, Snakes by avr. Bookmark the permalink.